NPD’s Oscar Power Foamer is a convenient hose end attachment that can be used for the treatment of many areas harboring pest problems. 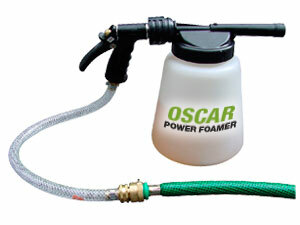 The Oscar Power Foamer is designed for quickly treating large areas and can be used with any garden hose supply. The system uses a 96 ounce bottle with a quick disconnect release for fast rinse downs and has an input hose and back flow preventer combination. Oscar Can Be Used Everywhere Pest Control, Sanitation, Construction, Manufacturing, Turf Industry, Food Processing, Automotive, Poultry and Horticulture. Eliminating odors and organic waste plays a major role in solving many pest control problems and needs to be a part of IPM program when dealing with crawling or flying insect pests.